I had a long conversation this week with my training partner explaining my reluctance to use protein powder. For many athletes, it’s unthinkable to go without a post-workout smoothie fortified with their preferred protein powder. There are plenty of studies showing importance of replenishing the body with a fine-tuned concoction of carbohydrates and protein, served up conveniently in a drink bottle. Visit the kitchen of any athletes and you’re likely to find a cabinet stuffed with economy size tubs of powder supplements of all kinds. There are blends for pre workout, during workout, post workout, first thing in the morning, last thing before bed. It is a routine that I cannot get on board. What bothers me about these supplements go beyond their artificial and highly processed content. I hate the utilitarian aspect of ingesting strange potions for the sake of health and performance. If eating is a sliding scale between feeding and enjoyment, sports drink and supplement sit firmly at the feeding end. I do not get the satisfaction of tasting, smelling, and feeling of real food. Instead, it is gulping down liquid calories with promises of a better me. Thanks but no thanks. I’ve been sheepishly buying and devouring imported blackberries from Mexico. So juicy! So sweet! So cheap! My inner locavore wags her finger in disapproval every time but I cannot help myself. It is the dead of winter in Toronto. Every direction I look is grey, slushy, wet, and miserably cold. Sparkly winter wonderland it is not. Those little pops of dark violet remind me of warmer days. You know what else leads my imagination to warm places? Coconuts, the quintessential tropical flavour. I previously wrote about my family’s love of coconut sweets. When an impromptu chance to visit Dad came up last weekend, I decided to bring him a small treat. 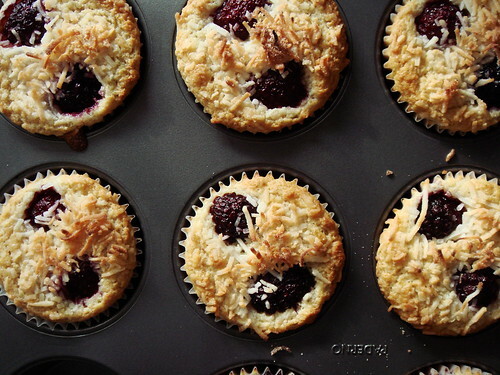 Ever since that time I made 101 Cookbook’s Blackberry Macaroon Tart, the combination of blackberry and coconut left a lasting impression. Of course, making a tart crust and filling were a bit too involved for a spontaneous afternoon. I wanted a simpler approach. Persimmon has always been a luxury fruit to me from my childhood in Hong Kong to my days living in Toronto. I am green with envy to read that people in the west coast have trees in their yard prolifically laden with fruit. Alas, persimmon is a treat that I only splurge when I spot the occasional sale in Asian supermarkets. As you can imagine, every time I encounter baking recipes calling for cups of pureed persimmon, I sigh deeply and turn the page. That was my reaction to David Lebovitz’s Persimmon Cake with Cream Cheese Icing in Ready For Dessert (recipe is available online at epicurious). 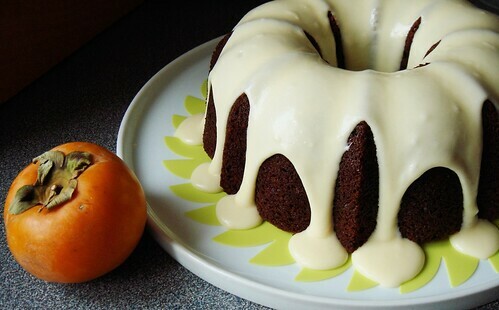 It is a Bundt cake adaptation of his persimmon bread recipe. I longed to find out how the honey sweet jelly-like fruit can transform the classic quick bread formula. Thanks to an unbelievable sale of overripe Hachiya persimmons at my local Asian supermarket ($2.99 for a case of 10!! ), I found out at long last. With the start of a new year, making resolutions and planning year-long project seem de rigueur. One of the many initiatives on my 2013 calendar is to become more comfortable with entertaining at home. I love to invite friends over for brunch, lunch, tea, or dinner but the challenge has always been getting multiple dishes ready on time. I want to enjoy the company of my friends, not stuck cooking away in the kitchen! The desire to practice entertaining struck a chord among my food loving friends. That is how our monthly supper club came to be. It has been far too long since I last baked bread. Last winter I got into a nice rhythm of baking my weekly loaf which continued even when I was living in Fort Lauderdale during my training sojourn. Somehow, that habit fell to the wayside and I relied on the addictive Seeduction Bread from weekly visits to Whole Foods. Perhaps the post-holiday mentality is taking over. I crave the wholesomeness of bread baking once more. 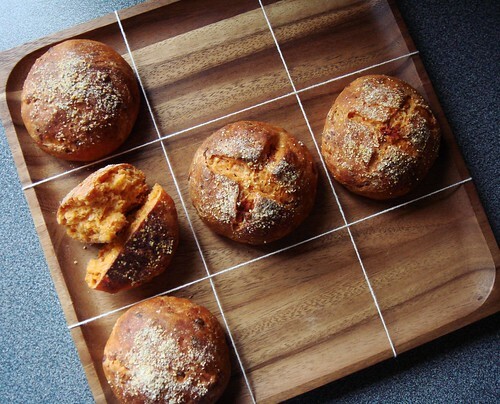 The wholesome feeling is not limited to the taste of homemade bread. It’s the entire experience of kneading dough, watching it rise, and smelling the yeasty aroma wafting from the oven. I crave the connection between me and a loaf of bread from start to finish. My love for coconut comes from my Dad. Growing up, some of my favourite treats include hard coconut candies, coconut-covered marshmallows, kaya (coconut jam) on toast, curry enriched with coconut milk, voluptuous tapioca coconut pudding, and of course the simple macaroon. They were all introduced to me by dear old Dad. The coveted blue nugget in a box of Quality Street? I always tried to pick out the Coconut Éclairs before my Dad could get to them. Actually, I still do that except I have the whole box all to myself now that we don’t live together anymore. This week I rekindle my love for coconut with two different treats. Melissa Clark’s Double Coconut Granola is a perennial favourite especially with the crispy caramelized coconut chips. A handful of dried pineapples gave the recipe a pleasant pina colada twist. I haven’t been able to stop snacking on fistfuls of granola in between meals. The other treat is a recipe I’ve been eyeing since Christmas. 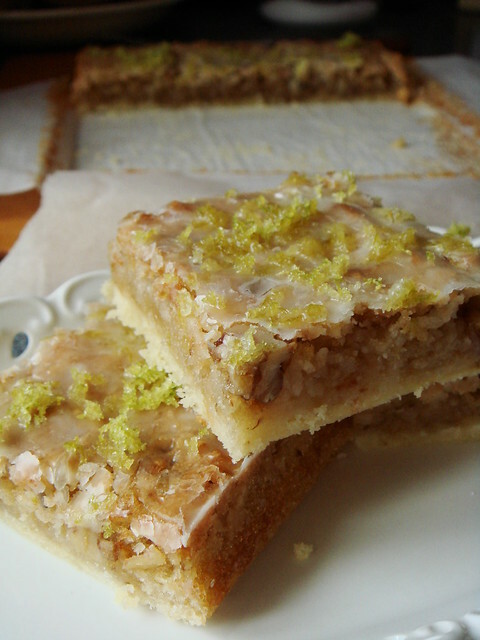 My holiday cookie extravaganza could not accommodate these Coconut Lime Dream Bite but it was the first recipe I bookmarked in America’s Test Kitchen Christmas Cookies 2012. Lucky for you, the recipe is currently available online for free! How do they come up with a name like Morning Glory Muffin? I am most definitely not a morning person so it’s hard to fathom those early hours of the day being glorious. You know what is also deceiving? 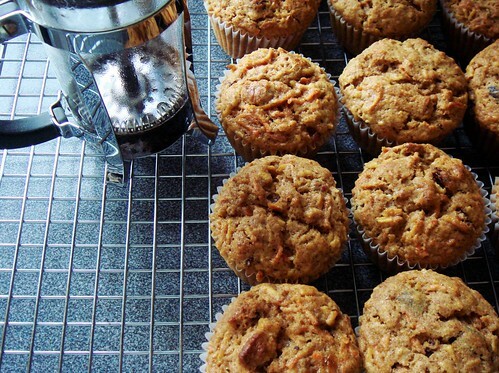 That morning glory muffins are healthy and virtuous and fitting for January when everyone vows to eat better for the rest of the year. Virtuous they are not. Golly, they do taste good though. Perhaps even gloriously good. 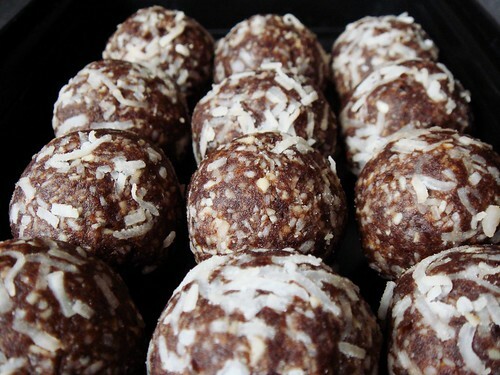 Packed with shredded carrot, grated apple, coconut, dried cranberry, pecan, orange, and wheat germ, how can they not? This is the muffin equivalent of the ubiquitous Everything Bagel. There is a bit of everything to please everyone. I started 2013 with two things I had always wanted to do. First, I went to a beginner detox hot yoga class at my local studio and sweated buckets. 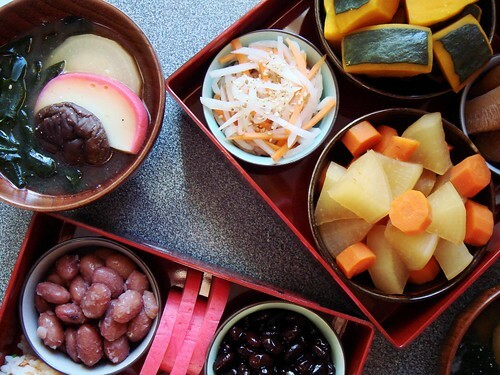 The other, I prepared a traditional Japanese New Year osechi jubako. In previous years, I enjoyed ozoni on the first day of the year but it just did not feel as festive. Last Saturday I found myself at the Japanese grocery store and mindlessly started putting random osechi ryori ingredients into my basket. Meticulous planning was not in the cards but the meal just organically came together. 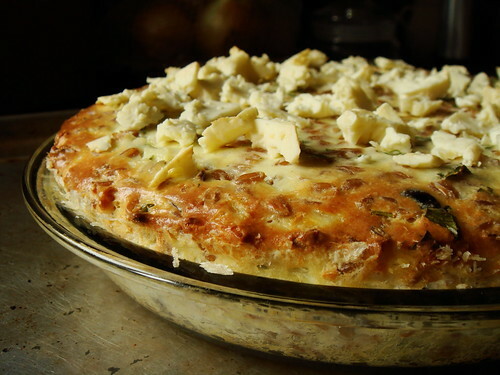 Great thing about these traditional dishes is that they are meant to be made ahead. Cooking is not to be done on New Year Day so people would not inauspiciously begin the year with burns or cuts. I’m totally cool with the notion so I could leisurely prepare each dish in the last days of 2012.